Celebrity nun who managed the Missionaries of Charity, a chain of clinics in Calcutta and elsewhere, which Mother Teresa perhaps more honestly called "Houses of the Dying." In these facilities medical care was abysmal, even by third-world standards, with limited access to medicine, no apparent interest in pain management, and the common re-use of needles to administer the minimal medicines that were provided. 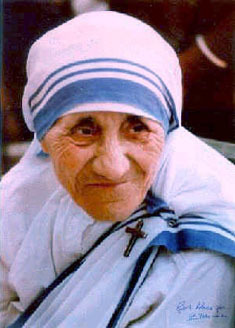 Despite ample funding that grew exponentially as Mother Teresa was idolized in the media, the budget for medicine and especially for painkillers was minuscule, and Teresa herself routinely reassured staff and patients that suffering is a gift from God, explaining that pain in life helps victims better appreciate the glorious afterlife that awaits. In December of 1984, an accident at a Union Carbide factory in Bhopal released 40 tons of a toxic gas, methyl isocyanate, killing more than 15,000 people and leaving up to half a million people blinded and otherwise suffering permanent aftereffects from exposure and contamination of the land and water. Missionaries of Charity already operated a clinic in the area, but its funding for medical care was not increased in the aftermath of the disaster. Mother Teresa instead made an appearance in Bhopal after the gas had cleared, where she posed for photographs and urged Union Carbide's victims to pray and to forgive the company and its officials. She was an adamant opponent of abortion and contraception, endorsed a mid-1970s effort that forcibly sterilized poor women in India, and spoke out against the legalization of divorce in Ireland -- opinions presumably informed by her own vow of celibacy taken as a teenager. She accepted an award from Haitian dictator Jean-Claude "Baby Doc" Duvalier, and spoke warmly of Albanian dictator Enver Hoxha after his death. She took a $1.25-million donation from noted embezzler Charles Keating, refused to return the funds when their stolen nature was pointed out to her, and even filed a deposition on Keating's behalf when he was later prosecuted. During her lifetime, Missionaries of Charity never complied with Indian law requiring charities to publicly release data on funding and spending. Even as the group's income was believed to have surpassed $100,000,000, it was estimated that only about 5-7% of the funds raised were actually spent providing services for the poor. Health care in clinics operated by the Missionaries of Charity remained substandard even in comparison to other non-profit clinics operating in the world's poorest regions, but for her own health care Mother Teresa routinely flew to the world's greatest hospitals. She died in 1997, and was beatified -- the first step to sainthood in the Catholic Church -- in 2003. For beatification, a miracle performed after death is required, and Vatican officials announced that after a thorough investigation, they had determined that by praying to Mother Teresa, an Indian woman named Monica Besra had been cured of an incurable tumor a year after Teresa's death. Doctors who treated Besra, however, said that the "tumor" was actually a tubercular cyst, which faded after she received prescription medications. The next step for sainthood requires a second "verified" miracle, which was announced by the Vatican in 2015. In 2008, eleven years after Mother Teresa's death, a man in Brazil with multiple brain abscesses was reportedly cured, after his wife offered prayers asking for Teresa's intervention. Curiously, reports of this second miracle have not (yet?) mentioned the name of the man allegedly and miraculously cured, instead referring to him only as "a Brazilian man with several brain tumors." And the march to Sainthood continues -- now with two certified miracles to her name, Teresa's promotion to Saint is expected in 2016.